The advanced Rolling Surveillance II™ course is the second half of the original course. *Please note: Rolling Surveillance is a prerequisite for this course. Rolling Surveillance II will go further in-depth into foot surveillance follow techniques, strategy, and set-up originally covered in the first class, including more counter surveillance training. The intensity is kicked up a few notches. Fast paced, intense, with planned and reactive decision making! Rolling Surveillance II™ instruction will teach safety and success through covert techniques and team organization. Three field days (realistic scenarios dealing with major drug/narcotics, Organized Criminal vehicle theft, and Terrorist activities) with two of those days including full day/night field scenario exercises. The focus is on conducting foot, vehicle, bus, light rail trains, airports, and mobile surveillance, via traditional and LCI Services observation and follow techniques. Foot and mobile teams will coordinate with emphasis on identifying and responding to counter surveillance. Photography of important criminal activity will be used for debriefings. Various surveillance technology such as GPS tracking & application, wire monitoring, with still/video photography, may be employed. During refreshers, airships may be requested if available to your unit. Reserve your spot in one of the classes listed on our training schedule. Be sure to read the testimonials from our clients to see for yourself why we are rated at the top in law enforcement training. 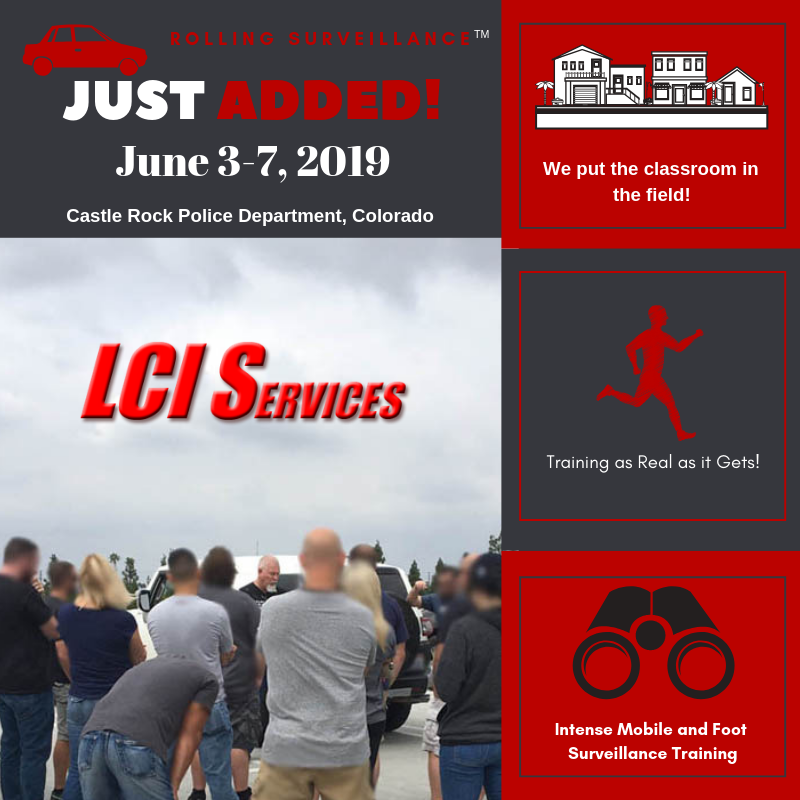 *Attendees must have completed the Rolling Surveillance™ course and have an understanding of the LCI surveillance techniques.